Think about it. How much food in your fridge or pantry at this very moment that’s maybe past its prime? How much food waste fills your trash bin? What are you doing with your food scraps? Are you composting them? A new documentary has set out to look at food waste as a global problem. By researching facts and figures, Wasted! The Story of Food Waste proposes some solutions to the problem. I recently had the opportunity to attend an early screening of the film, set to release next week on October 13th. I thought it provided some interesting viewpoints (though, I do have my criticisms) and a wealth of statistics and information, some of which I’ll share below. 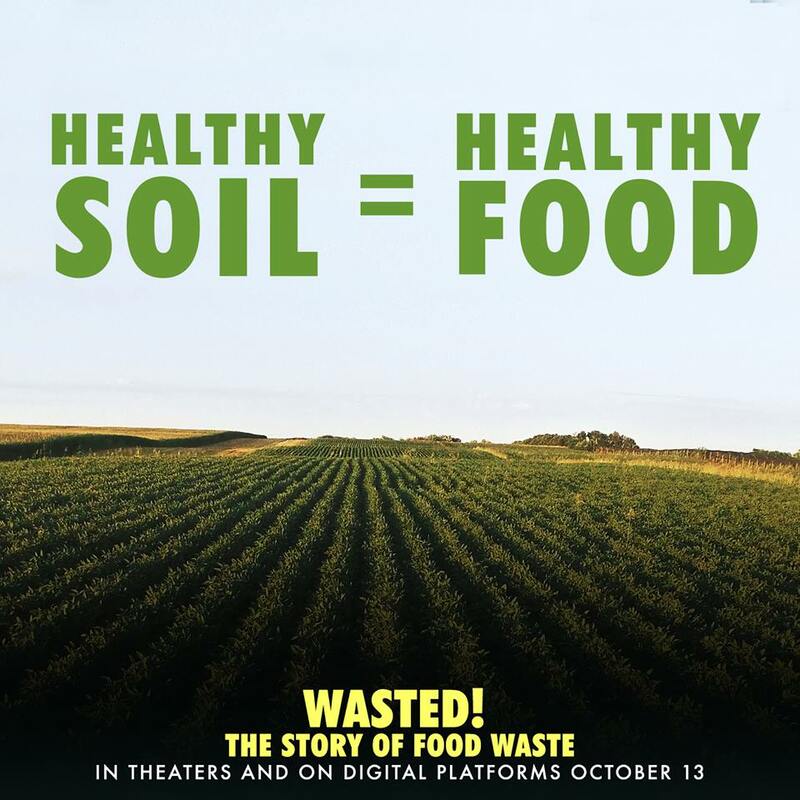 Overall, I felt as though I walked away from the film better understanding the breadth of the food waste issue, some of the factors contributing to it, and some actionable and attainable strategies for fighting the issue. Let’s address the awkward elephants in the room from the get-go. There are some names referenced in that snippet that may make some people uncomfortable. As part of the #metoo movement put eyes on men throughout the world, it has come to the public’s attention that Mario Batali has been accused of sexual misconduct. Batali is featured quite a bit in this documentary, which has been under production for some time. Also, you’ll notice that Anthony Bourdain is credited as an Executive Producer of the documentary. In June of this past year, Bourdain tragically committed suicide. Bourdain is also featured a good amount in the film, which sets a sobering tone as it opens to an interview with Bourdain. One third of all food that’s produced is never eaten. In the United States, that statistic jumps to 40% of all food—of which 90% will end up in landfills. That’s not such a bad thing, right? It’s compostable, after all. Think again. 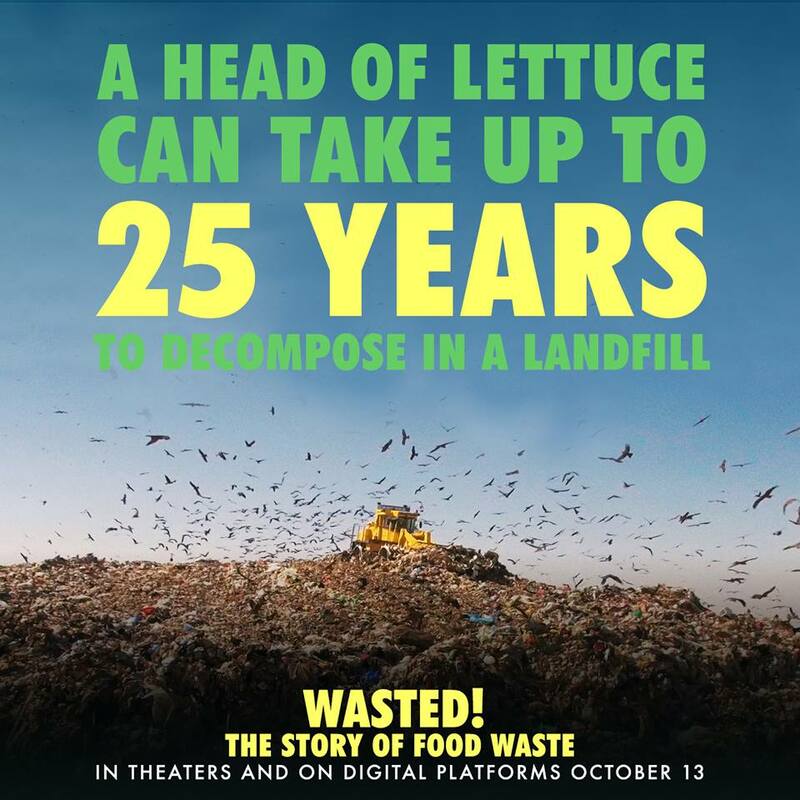 As the film pointed out, a head of lettuce, which I would have assumed could decompose relatively quickly, will take 25 years to decompose in a landfill. I’ll repeat that, it takes 25 years for a head of lettuce to decompose when it’s trapped in a landfill. 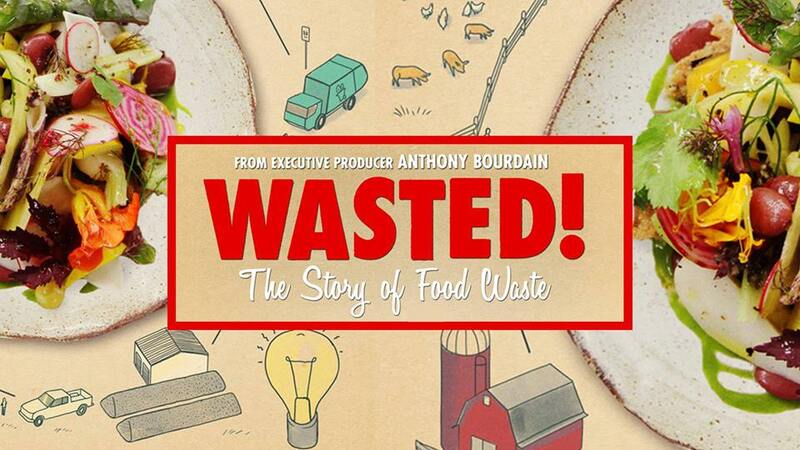 Wasting food is sinful—criminal, even—and “financially stupid,” so the documentary posits. The issue is with more than just the scraps on your plate, though. In fact, the film begins with a decently nihilistic approach, and lists off the challenges with food waste related to hunger, socio-economic challenges, environmental degradation, and so on. One in five children in the United States don’t have enough food to eat. One in six Americans, overall, experience food insecurity. On average, family’s spend about $1500 annually on wasted food. We should never put food into a landfill. Countries like Germany, Sweden, and South Korea are prioritizing getting food waste out of landfills. So what are the issues? Food waste is a complex and layered challenge. 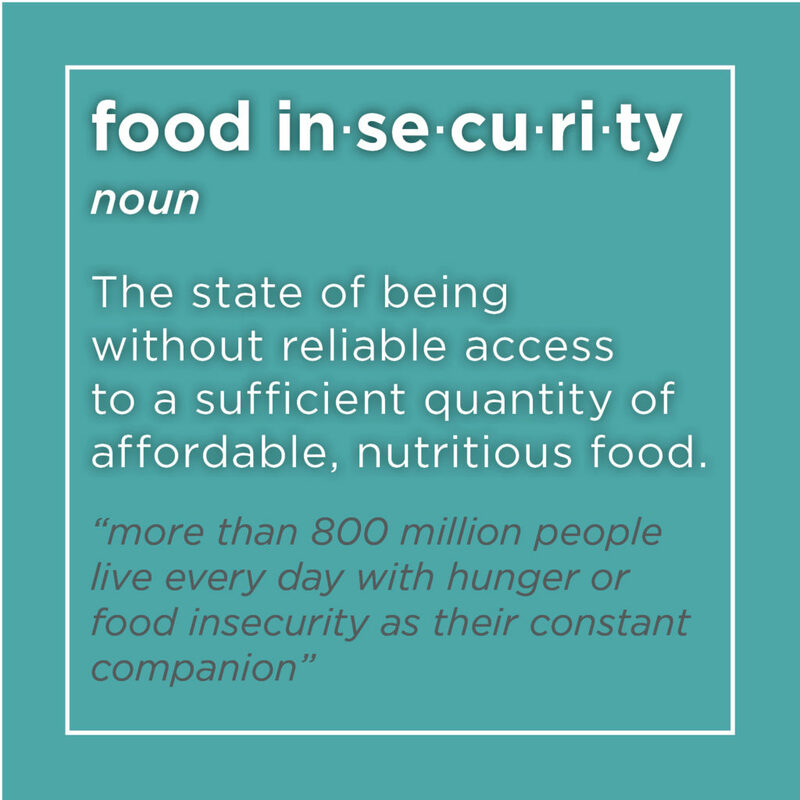 Some of the worst contributing factors include culture and social norms that fail to teach us about preparing food, confusing sell-by dates which really don’t mean anything as far as food safety is concerned, and a flawed system for growing and harvesting food. A lot of this comes down to culture. For example, what we’re taught how we’re expected to behave thanks to “social norms” are both forces that influence our values and actions. A lot of food is wasted not because it’s inedible. Rather, we waste food because we’re not taught how to prepare it, or simply because it’s a part of a food product that’s typically not eaten (e.g., carrot tops). Something as simple as retraining our behaviors, or learning how to cook with the unconventional parts of a vegetable, presents a huge opportunity to cut back on food waste. Sell-by dates are a mechanism used primarily for stores to rotate their shelves. These dates have very little to do with the safety of the food, but few people understand this. Nevertheless, those little dates convince overly-cautious consumers to toss food that’s perfectly edible into the trash. Systems of agriculture, particularly in the United States, are wasteful at their core. We’re growing too much of the wrong foods, and we’re subsidizing farmers to do so. Each year, about 10 million tons of produce goes unharvested. Wasted! shared many inspiring stories of individuals, organizations, and communities using innovation to address the food waste challenge. I’ve pulled out a few worth noting to the right. Supermarkets “are the apex of the power in our food system,” explains Tristram Stuart who is recognized as THE global authority on food waste. Supermarkets have such power, indeed, that they could probably single-handedly sole a lot of the world’s food waste problems out right. One supermarket is taking their stab at addressing the food waste issue. The Daily Table is a non-profit grocery store which plays a role in recovering food (diverting it from the waste stream) and in providing affordable, healthy food options to a lower-income community. A few countries and their municipalities are working toward diverting food waste from landfills. Seoul’s successful “Pay-As-You-Throw” system, for instance, charges residents based on the weight of household food waste. This program has almost entirely eliminated food waste ending up in landfills. What’s the worst contender when it comes to food waste? Grain waste sure is significant. For instance, one company asks, “did you know that 44% of bread is wasted?” In England, Toast Ale is brewing delicious (so I would assume) beer using unused bread from bakeries, and unused crusts from shops. Better yet, they give 100% of their profits to Feedback, a charity fighting to end food waste. Let’s put an end to food waste. And let us be wasted instead. Massimo Bottura and Lara Gilmore founded Food for Soul to “empower communities to fight food waste through social inclusion.” Bottura, through this non-profit and in collaboration with Gastromotiva, launched Refettorio Gastromotiva, a soup kitchen with a Michelin-Star mindset that used food waste from the Rio Olympics to provide meals to the hungry. Additional Refettorio locations have opened throughout the world, with more planned. Getting our youth involved is a surefire method for cultivating stewards of our planet. That’s exactly what Samuel L. Green Charter School is doing with their Edible Schoolyard, where kids are taught to compost. In fact, the entire school has integrated a composting system into their cafeteria, so all kids are getting exposed to the idea of compost and the waste stream. It’s an inspiring program and I hope to see more like it pop up all over. Okay, I never thought I’d be praising a dairy company (and such an enormous one, at that) on this site. That said, I think it’s important to recognize innovation and best practices—both of which have been demonstrated by Yoplait’s Greek Yogurt factory in Tennessee. “Since August of 2015,” General Mills explains, “the plant has been processing its leftover whey from Yoplait Greek lines and using it to produce 10 percent (1.6 megawatts) of the plant’s electrical needs.” To be fair, that’s pretty cool. So kudos to Yoplait for building this into their process and working toward closing the loop. While I found Wasted! to be quite informative and I praise it for calling attention to a massive issue, I have some criticisms of the film. First, I should warn any animal lovers out there that Wasted! is choc full of graphic and upsetting imagery of animals raised for food, being butchered, etc. And, I must say, I was discomforted that the documentary used an optimistic rhetoric regarding the continued use of animals in our future food system. I take issue with this not only because it made for an uncomfortable viewing experience for someone with my ethics, but also because the film seems to have completely ignored the sustainability issues related to animal agriculture. Animal agriculture is an inefficient, resource-heavy practice. Food waste, furthermore, is essentially guaranteed with the consumption of animals. Wasted! even drew attention to some of these reasons. For one, stigmas that people hold regarding the consumption of certain animals or various body parts lead to large percentages of an animal’s carcass going uneaten. Additionally, hundreds of thousands of animals are killed as bycatch from wild fishing. (Time for a plug! Have you heard of Good Catch Foods, yet? Releasing later this year, this plant-based seafood company has set out to call attention to and address the overwhelming and horrendous impact of fishing. I cannot wait!) And do you remember how Toast Ale draws attention to grain as a big food waste contender? Yeah, in the United States, 70% of grain is harvested to feed animals that will be slaughtered, and not starving humans. Do I believe that the animals we have brought into this world need to be cared for and fed? Yes. But I also believe that we can end animal suffering outright and reduce the number of starving individuals by leaving animal agriculture behind. Despite the film’s exploration of less impactful animal farming practices, the most efficient and sustainable solution would be to move away from animal agriculture entirely. However, by praising the “nose to tail” outlook, Wasted! painted the farmed animal industry in hues of opportunity—neglecting to mention the sustainable and cruelty-free alternatives. Instead of training people to eat the unpleasant parts, or exploring ways to make these parts more desirable—both tactics which the film praised—couldn’t we recognize a growing trend that moves away from eating animals in the first place? Now, by referencing the “nose-to-tail” approach, the film criticized produce farming practices. I do think this is an important point to raise. Animal farmers, butchers, and meat-eating consumers have found a way to use every bit of animals slaughtered for their food. Why are we not doing the same with our produce? We toss the parts we don’t know how to cook—and we don’t even do that right because we’re tossing unused produce in landfills rather that into a compost pile. Wasted! has inspired me to consider how I can use all of what I buy and divert any remnant food waste from entering landfills. And I’m encouraged to learn about industry trends to close the loop—there’s money to be made in addressing food waste; thus, many startups are addressing the issue (and receiving a pretty penny to do so!). And while I do take issue with the film’s stubborn support for animal agriculture, I don’t believe we should ignore the other information it provided about the alarming food waste challenge. I do recommend viewing the film, and I insist that everyone—whether you watch it or not—work toward reducing food waste. If you’re interested to learn more about food waste, here are some further reading options! To address our collective failure to use all the food we grow, chef Mark Bittman, who was featured in Wasted! has become an avid advocate of altering our cooking practices to reduce waste. His book, entitled How to Cook Everything, focuses on making home-cooking with fresh ingredients more accessible. And, while not an exclusively vegan book, it provides techniques and suggestions for making the most of the food we grow, harvest, and buy. And he has published a How to Cook Everything Vegetarian edition. Waste Not is presented to us by the James Beard Foundation, America’s leading organization for culinary innovation. With its collection of recipes, you can start to think differently about the foo in your pantry. Waste Free Kitchen Handbook strives to make reducing food waste second nature by providing readers with the right tools—checklists, recipes, food tips, and infographics. While Cradle to Cradle isn’t specific to the food waste issue, it talks about closing production and consumption loops to reduce our waste.